Blast your way back home in Space while trying to keep your Oxygen levels in check! A Game where the level is trying to delete itself! A Game where avoiding work is rewarded! Concerning the limitation. If I made a game involving, "heroes" and "villains" in the sense that they are just 'names' used to represent a group of people, would that still be breaking the limitation? Since the limitation specifically states heroes in the context of 'good' or 'helpful' people. With my idea the 'heroes' basically have the same role the 'villains' (which does not involve them being 'good' or 'helpful'). Can't wait to get playing when submission time has passed! Right. Home Stretch. Due to the scale of my project (by the way I count, 426 lines of code in one Player Script), I've been killing myself this entire week. So I want this day to just be focused on quality of life improvements, bug fixes, add content, content, content and then finally just add some encounter "scenarios" (maybe having a small over world was a bit over scope). Base mechanics and features are all done. I decided to give my game a massive visual overhaul (as you can see from the image). After some research into UI design I think I made a pretty swell looking one (don't you think?). Also in the GIF you would be able to see that Drinking - is - done! You can now drink your coffee for boosts. Status Effects in general are complete. Enemies now charge up a unique special ability that may aid themselves or harm you. Certain coffee may also apply a status effect on enemies. Now it's all about the polish. This entire day (9:30 in Britland right now) I will spend polishing the battle system gettting all the nooks and crannies sorted out so for Saturday I can finish it off with basic encounters. Ohh, it's super neat and clean. I love the way you sort of, 'built' it into the world as well. I mean compared to my (literally) non-existant knowledge of UI this is really neat. What font did you use for the GudNuf (nice name by the way) Coffee Co. Lettering if you don't mind me asking. Day.... 3? done. God, what a day. This is my very first RPG-esque kind of game with this kind of battle system. Unfortunately I kind of underestimated how difficult it is to not only have 2 seperate inventories but also expect them to interact with each other in a way which is bug-free. Well, I had to spend a good 30 minutes battling a stupid bug (items not highlighting correctly) and... well... you know. 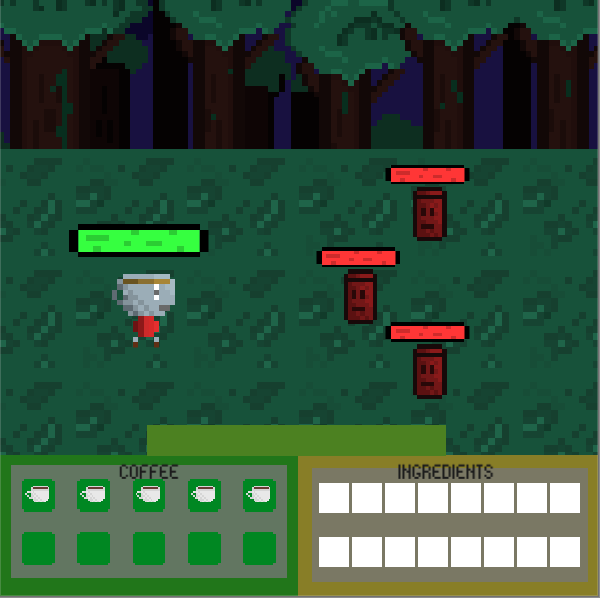 Tomorrow, I'll add status effects (for drinking coffee) and that should wrap up the battle system. After it should be polish, Polish POLISH, POLISH. Then I'll have to find a way to make encounters - make sense. I love the Game and Watch-esque style. Really nicely detailed hud as well. I decided to go for a dark/ forest theme. I played around a bit with the UI and am quite happy with how it is presented here. (Note, the top tab is for crafting / mixing). Due to me losing my mind over trying to make an inventory system (rolling back to a previous version is never fun) where all the items are unique and don't all derive from the same class I decided to change up my key mechanic a bit. Instead of using Ingredients to improve your basic coffee you use the ingredients to make unique coffees (so a weird reversal thing). I love the style and the colours and the particles and the and the... That's a really good looking cup of coffee. Being able to see your progress is one of the best things about programming or game dev. I just spent around an hour working on the inventory system. Something that took me a couple of weeks to get the hang of a few months ago. Bad art. I can't make up my mind for what art style I want to go for so this is just........ placeholder 'art'. Next up; actually being able to attack your enemies! Coffee? Coffee?! How could I not think of such a brilliant idea! Even though I joined slightly late I already have a good idea planned out. Hint hint, it's a Turn-Based card like game with a similar concept to something like Super Paper Mario Sticker Star (hopefully the execution on this one won't be terrible in comparison ^^). So have a (late) good jam! Hi slimecase. I just played through your game and gave it a review, but I'm not too sure whether it actually went through or not. Just to be save I'll just re-paste it here. Hey! I saw your post on the forums and went to play your game. I finished it in around 15-20 minutes here's some feedback. The game has a great aesthetic. Most of the scenery blends well and it didn't feel bland or repetitive when I was playing. I liked the ambient sounds while inside the levels, it added a nice mood. The sound effects are well done too. This is probably what bothered me the most. What should have been 10 or so minutes of play turned into ~ 15 as I was trying to jump between platforms. Some of the hit boxes I find are way too large and make jumping irritating. Also I felt like there needed to be more horizontal force on a jump. It would have been nice to see some basic puzzles in the levels. Or possibly collectables hidden in areas meaning one has to explore the levels to find them. This seems like the kind of game that should have fewer levels but every level is filled with content. And for that to work there needs to be an incentive to explore every bit of the level.